Hello everyone! Happy New Year! 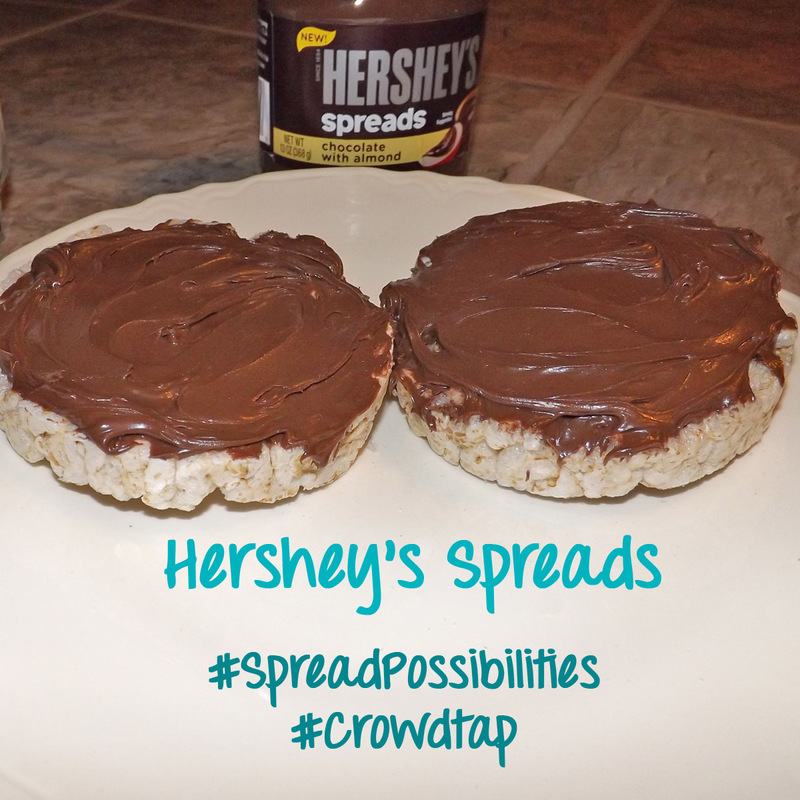 Already a week into the new year and I am happy to share with you my latest Sample Share Opportunity with Crowdtap. I was so excited to be chosen to receive a free jar of the new Hershey’s Spreads, Chocolate, Chocolate with Almond, or Chocolate with Hazelnuts. Is anyone else a Nutella nut? Because I totally am. I was randomly chosen to receive Hershey’s Spreads Chocolate with Almonds. I was a little disappointed that it wasn’t the Hazelnut or regular Chocolate flavor, but its always nice to try something new. It was a little stiff to work with, because it had been sitting in the negative temperatures in my mailbox for a few hours before I got to it. At first I didn’t really like the almond after-taste. But then I had a spoonful and tried it on the rice cakes and I definitely like it! The last time I had Nutella I tried it on plain rice cakes and absolutely loved it. So I bought unsalted rice cakes and have been waiting for my sample to arrive to eat up! I’m also going to try this on bananas. I liked bananas and Nutella, so I should like this as well. I usually don’t mix chocolate and fruit, but I think this new chocolately goodness needs some experimentation! I checked out the Hershey Spreads site and it includes some tasty recipes! What do you think? Any you might try? I am a member of Crowdtap and received this sample and share for free to try and review. I belong to Crowdtap and often receive products free of charge, via mail or by coupons. I don’t have an active referral link to share with you, but will update this post when the site updates, if you are interested in joining Crowdtap. This entry was posted in Crowdtap, Food and tagged chocolate cheesecake, chocolate dipped pretzels recipe, chocolate pie recipe, chocolate poke cake recipe, chocolate with almond, chocolate with hazelnut, crowdtap, Hershey, Hershey Spreads, hershey's spreads, nutella, sample and share, spreadpossibilities on January 7, 2014 by christinapertz1.